What Do Woodchucks Eat in Gardens? Woodchucks, commonly referred to as groundhogs, are large rodents weighing anywhere from 5 to 12 lbs. and measuring up to 2 feet in length. The brown to yellowish brown fur is silver tipped, the head is flat and short and the eyes are small. The animals have large, curved claws on their feet supported by thickset, short legs. The thick hairy tail is about one-fifth to one-third of the total body length. Woodchucks are among the pests of gardens and feed on a variety of plants. Woodchucks are entirely vegetarian in their eating habits. In gardens, the animals are likely to feed on shrubs, grasses, ferns, young shoots on trees, corn, ripe apples, fresh flowers and young elm trees. The pests also damage a number of agricultural crops including sorghum, red clover, alfalfa and wheat. Other favorite foods include beans, peas, carrots, cabbage, broccoli and tomatoes. There are very few succulent plants that woodchucks do not target. Woodchucks are terrestrial animals and diurnal, feeding mostly during the day and sometimes also at night. The animals are good at climbing trees and are able to reach fruit and eat the new growth on trees. Favorite feeding times are evenings and mornings with a minor feeding time around noon. The animals are likely to travel as far as 75 feet or more from their main dens in search of food. Woodchucks have a habit of standing up every 30 second while eating to look around. The animals become fat during late summer as their body prepares for hibernation. Common woodchuck habitats include brush and hedgerows growing along pastures and old fields on the croplands close to small woods. Using their clawed feet, the animals dig burrows in well-draining soil and often on slopes. 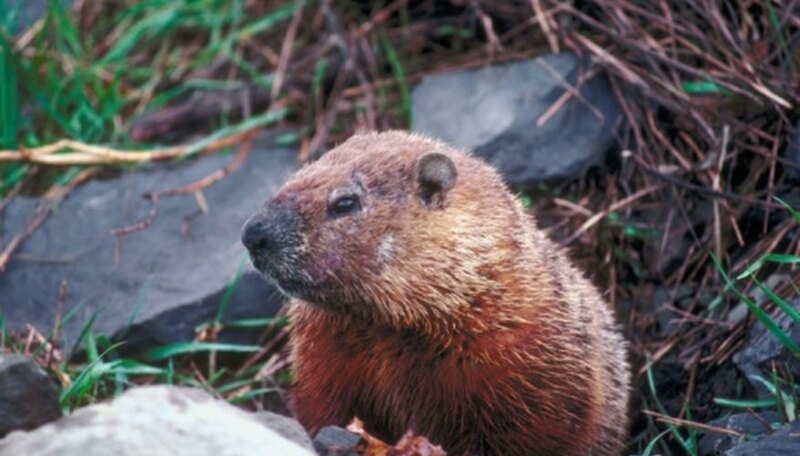 Woodchucks are also likely to create their burrows under decks, porches, sheds and walkways. The burrows usually have multiple entrances with the main shaft up to 50 feet long. The entrances of burrows are concealed with soil and rocks. You can control woodchuck damage in the garden in a number of ways. This includes creating fences with about a foot of the lower edge buried underground; installing electric fencing; making sure there are no cracks in walkways, porches and sheds that could provide entryway to the pests under these structures; throwing fumigants such as gas cartridges into burrows; trapping the animals live in wire traps; using commercial animal repellents; and shooting in areas where the use of firearms is not prohibited.